I have not been terribly consistent in working on my girls' writing. They do written narrations regularly, and I should be working with them on correcting them, but... there tends to be a lot of drama associated with editing, so I have avoided it. Just keeping it real here, folks. They are taking an online class for literature this year, and it's ] going well, so I was excited to have the opportunity to review the Essay Rock Star Personal Statement Writing Course from Fortuigence. I love the option of online classes. There are just some things I am not comfortable teaching, like writing, and having someone else teach it for me takes the stress out of the situation for both myself and my children. I also like that they receive input from someone besides Mom, all from the comfort of our living room in our pajamas, if we choose. Lily Iatridis (Ms. I to her students) was a classroom teacher for 10 years, and also taught in Japan and in a private school before switching over to online teaching. She founded Fortuigence as a way to teach one-on-one classes, but still have time and flexibility to be with her family. Her courses are intended for middle and high school students, and most of her clients are homeschoolers. You can purchase each course individually for $57, or you can sign up for all four courses for $197. Students receive .125 high school credit for each individual course, or one full credit for completing the entire series. The online classes are broken down into small, do-able chunks. The goal is mastery, so students work at their own pace through each section. There is a video to watch for each lesson, with some reading, all of which takes about 15 minutes. Ms. I offers an audio-only option if students do better without the visual component, as well as a complete written transcript if reading works best for their learning style. She thinks of everything! Once the student watches the lesson, they go and do their assignment, and then come back and submit it by typing it into the online form. I chose to have my 14-year-old work through the Personal Statement Writing Course, because the time is coming when she will need to be able to write a personal statement for college applications and other things. I am not comfortable with writing my own personal statement, so I thought it would be a good idea to have Emma work with someone else. She was nervous about submitting her writing sample, and so was I, honestly. When we went through her most recent narrations, I was made aware that I need to be paying more attention to her writing (and her sister's) and wasn't sure what Ms. I would think. I needn't have worried. She responded with a very nice message stating she could tell Emma was a good writer and she was looking forward to working with her. She has really helped her (and me) through the process of creating a personal statement. She has been nothing but supportive and encouraging to both my daughter and me. I have experienced a fair bit of trepidation over teaching writing, because I wasn't sure I could do it well. Ms. I took all the worry away and made it fun (or at least less stressful) for Emma and me. Whenever we haven't been sure what to do, we sent her an email, and she has responded back quickly with reassurance and clear direction. She is a master at virtual hand-holding. Emma is still working on her personal statement, and I have seen her confidence increase as she's worked with Ms. I. 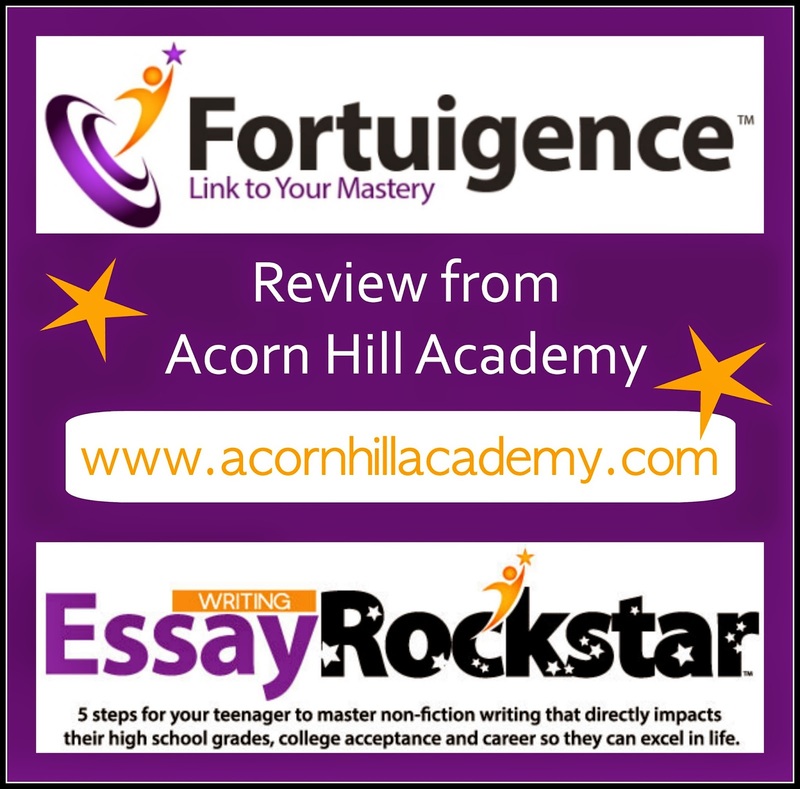 If you're looking for a homeschool writing course, and an online option would work for your family, I highly recommend Fortuigence's Essay Rock Star program. Your student will gain solid writing skills, and Ms. I makes it as painless as possible–even fun. 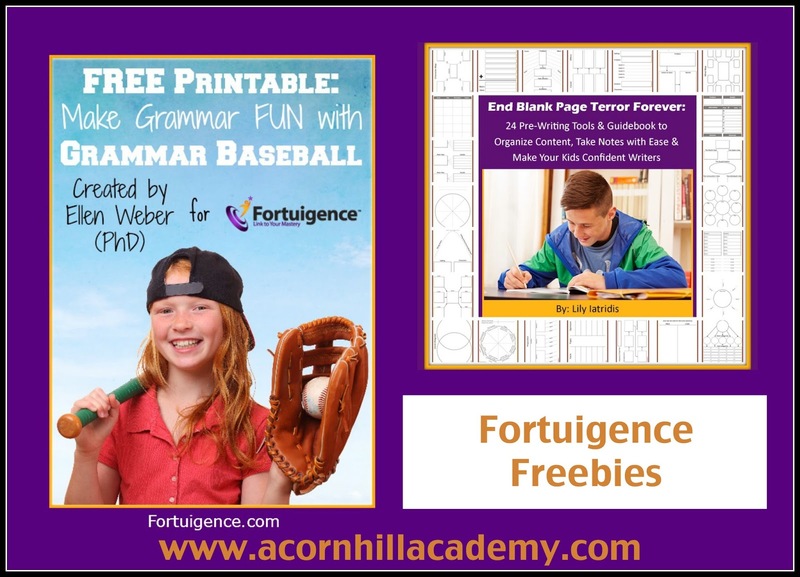 Fortuigence offers some great free downloads, which you can access by signing up for their End Blank Page Terror, and Grammar Baseball, an ebook to make teaching and learning grammar more fun. Definitely check them out! Connect with Fortuigence on Facebook, Twitter, Google+ here and here, Pinterest and YouTube! Thanks so much for your review, and I look forward to finishing the course with Emma!